Wondering the best whiskey rocks to go with your favorite whiskey or old fashioned? We’ve got you fully covered! Whiskey lovers now have several options when it comes to serving up their favorite liquor. And, interestingly, the best ice may actually be no ice at all! So, if you’re looking for types of liquor stones (or just curious as to the best way to serve liquor on the rocks) you’re in the right place. Continue reading to learn different types of whiskey rocks to put into your drinks – including scotch and bourbon. What is whiskey on the rocks? When someone orders a whiskey (or any other alcohol for that matter) on the rocks, they are asking for straight liquor poured over ice. There are no mixers or other ingredients added. This is traditionally how most whiskeys were served before the invention of cocktails. Is it wrong to put ice in whiskey? Not exactly. In fact, whether you put ice in your whiskey (or not) comes down entirely to personal preference. However, some whiskey connoisseurs argue that the addition of ice dilutes whiskey and hinders the flavors. But others believe that ice can actually enhance the aromas of certain whiskeys. In any case, the main purpose of putting ice into whiskey is to keep the drink cool. Nonetheless, some people prefer their whiskey on the rocks purely for the fact that it does dilute the drink and take the edge off as the ice melts. Believe it or not, all ice is not created equal. When using ice for whiskey rocks, it’s best to use larger pieces so they won’t melt as quickly. To be clear, you should make your ice from the cleanest water available. Plus, be sure to separate the ice from any other food you have in the freezer to avoid it soaking up outside smells and flavors. Finally, if you don’t have good clean water on tap, you can make crystal clear ice cubes out of boiled water. Basically, ice balls are giant ice cubes that you can make using large, round molds. The idea is to create big pieces of ice that melt in your whiskey at a much slower pace. Thus, rather than adding several pieces of cubed ice, you’d only require one ice ball to keep your whiskey chilled. Plus, its round design helps to naturally keep the ice ball cool and, in turn, slows down the melting speed. Whiskey stones offer a way to keep your liquor cool without watering it down. Fortunately, there’s an abundance of materials from which you can make your own whiskey stones. For example, stainless steel, milled soapstone, natural soapstone, and solid granite are all good options. The benefit of whiskey stones is that they cool your drink down instantly without watering it down. Plus, you don’t have to worry about constantly refilling your ice tray. Once they’ve served their purpose, simply rinse your whiskey rocks off and put them back in the freezer for next time. Want to experiment with different types of drink rocks to discover your preference? 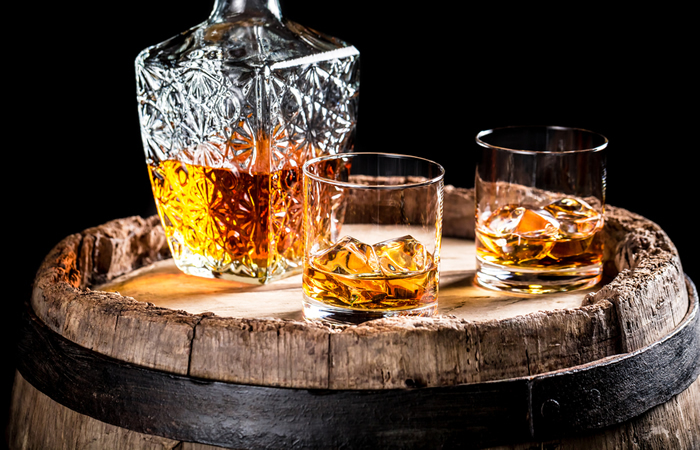 Check out the best affordable whiskeys to try so you can experience the difference using ice, ice balls and whiskey stones without breaking the budget.